If you happen to travel down to the south of France, in Provence, make a little "detour" by "Les Baux de provence". You will surely appreciate this region natural, dry, arid, wild beauty; its wines and also its authentic, rural, rich, flavorful food (especially in the restaurant which bears the same name as this lovely region and happens to be one the best restaurant in France). In the heart of "Les Alpilles" (sort of foothills chain south-west of the Alpes), a few kilometers far from the village of "Les Baux", one can find the gate to Mas de Gourgonnier. Benefiting from this unique location and their long family tradition, Nicolas Cartier and sons, Luc and Frederique, produce great wines with strong personalities: Red and Rosé wines from AOC "Les Baux de Provence" and also white wines. For the amateurs of regional Provence flavors, they also produce an extraordinary smooth and balanced olive oil. (FYI: Created in 1995, the AOC "Les Baux de Provence" is only for Red and Rosé wines. The whites are sold under the AOC Côteaux d'Aix en Provence. The olive oil from Les Baux is also an AOC). Built in the middle of the XVIII century, the "Mas" (typical country house of Provence) was a farm of the "Abbaye de Pierredon" which used to belong to their family. They used to produce all the necessary resources for the monks of the Abbaye. In this wild, rocky landscape, the sheep were living under the olive trees and the fruit trees until 1950. It is at this period that the first vines were planted. Rapidly a cellar was built. Luc Cartier and his father came to live here and established Mas de Gourgonnier in the 70s, and then Frederic joined them in 1990. The Domaine is now mainly run by Luc and Lucienne Cartier, and since a few years, their daughter, Eve, works with them. Together, they work as a united family aiming at one goal: produce the best Provence terroir expression in a bottle. They possess about 45 hectares of vines and 20 hectares of olive trees, planted on limestone-clay soils. This type of soils is really characteristic of the south slope of the "Alpilles". The Cartier family prefers natural methods and minimal intervention in the vineyards and in the cellar. They have used "Organic" and sustainable farming for over the past 40 years, long before these words became common in our daily wine vocabulary, and they are certified Biologique Culture (Organic in English). Their white and red wines are usually a blend of different grape varieties: Grenache, Syrah, Cinsault, Carignan, Mourvèdre and Cabernet-Sauvignon for the reds, and Sauvignon Blanc, Grenache Blanc and Rolle (also known as Vermentino in Italy) for the whites. 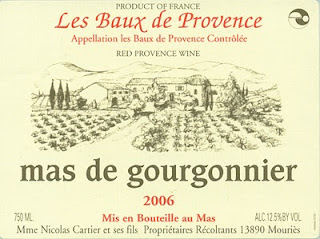 Mas de Gourgonnier Tradition combines 38% Cabernet Sauvignon, 33% Carignan, 20% Grenache, and 9% Syrah. After harvest done partly by hand and partly by machine, the wine was fermented than aged in stainless steel tanks to keep the maximum freshness, juiciness and fruit flavors. (FYI: at Mas de Gourgonnier, only the "Reserve" wines are aged in oak: big "Foudres" of 50-70hl for the reds, and in oak barrels for the whites). The 2006 Mas de Gourgonnier Tradition boasts aromas of wild berries and blackberries with floral and Garrigue notes. The palate is juicy, somewhat rustic, with present yet integrated tannins adding dimension and structure to this well crafted organic Provençal red wine. The black berry flavors intermingle with hints of Cassis and spice in the mid-palate, while the finish is all about slightly dry tannins and more Garrigue. It will pair well with a roasted rack of Lamb, grilled T-bone steak and various cheeses. FYI: "Garrigue", like the word "Terroir", is a French word (or term) that encompasses many components as a whole. "Terroir" usually refers to the combination of climate, micro-climate, type of soils, location, exposition, geography and topography, and the uniqueness of the surroundings influencing particular vineyards and the produced wines in a determined area. "Garrigue" is a word (or a term) mainly used in Provence and the Languedoc. However, some of us use it, during tasting in our tasting notes, as a reference for aromas and flavors found in various wine regions in the south of France bordering the Mediterranean Sea . In Provence, Garrigue usually refers to the landscape, climate and type of soils; but more importantly, it combines the earthy aromas and flavors of different type of herbs (Thyme, Rosemary, etc..), bush trees, olive trees, fruit trees and pine trees, with the very distinctive scents of flowers (Lavender, etc..), bay leaf and dark fruits (Cassis, Blackberry, etc..), together mixed with the influence of the Mistral wind and the Mediterranean sea. Just close your eyes and imagine yourself walking in a vineyard in Provence during the hot month of July... are you there yet?